The Birmingham-born comedian will return with the fourth season of his acclaimed news satire show Last Week Tonight this evening (February 12) in the US, before airing in the UK on Sky Atlantic tomorrow night (February 13). Ahead of the return of the show – which breaks down a selection of the week’s biggest news stories before covering one particular topic in depth – Oliver has addressed the effects of Trump’s controversial first few weeks in office. “I care about facts the way I care about oxygen and imbibing enough water a day to live,” Oliver said. “Everybody should care about facts. That is something all of us should agree on. That is what we’re wrestling with at the moment [with President Trump], right? It feels interminable to kind of talk about in theory other than to say we’re trying, we’ll give it a go, and we’ll see. It affects everything. Earlier this week, US talk show host Jimmy Fallon addressed his controversial interview with Trump, which took place in the weeks leading up to November’s election. 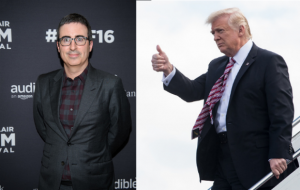 The post John Oliver on Donald Trump’s administration: “This isn’t just misleading, this is turbocharged” appeared first on NME.